Which management plugin is the better alternative for my blog? With more and more competing premium WordPress plugins it gets harder and harder to answer that question. This article takes a look at two popular plugins to manage multiple WordPress sites: It compares CMS Commander with ManageWP in order to help you with your decision in choosing one. There are several other alternatives to CMS Commander and ManageWP on the market which I have compared in separate articles. Go to my main WordPress Management Software comparison to start your search. Please note that this comparison only looks at the features on paper as reported by either plugin’s developers. It does not and can not tell you if or how well a certain feature will work for you. 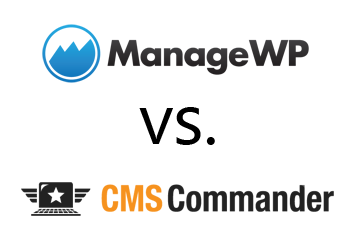 Because such a verdict would depend on too many variables, including your server setup and personal preference, I have decided to stick to the hard facts for this feature comparison between CMS Commander and ManageWP. In my comparison I track 35 different features for all the WordPress management plugins. In CMS Commander you can find 32 out of 35 of those features. ManageWP on the other hand offers 32 out of the 35 features in total. 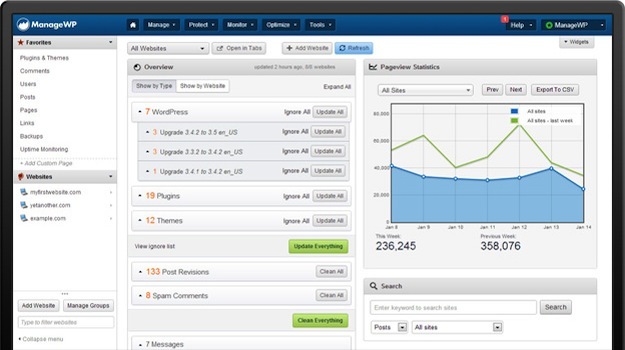 Even if many of the features compared above overlap between those competing products there is one very important difference: CMS Commander as well as ManageWP both provide a unique interface and dashboard from which you will manage all your WordPress blogs (pictured below). Since it is hard to rate the quality of such an interface objectively I recommend that you try both products yourself by signing up for the free trial offered by either service. WPscoop indexes the exact prixing plans of all compared plugins. Please refer to the table below for a quick overview of the prices of CMS Commander and ManageWP. To find the cheaper management plugin for your individual needs please go to my main comparison article. There you can search for the features you need and then see the exact price you would need to pay for CMS Commander or ManageWP (as well as other alternatives). Most WordPress plugins have an option to test their service for free, either thrhough a basic free version, a trial period or online demo. Check if such an offer exists for CMS Commander and ManageWP and if so: Make use of it! By doing so you can compare both plugins directly and find out which one is the better alternative in you situation. But wait, there is more! 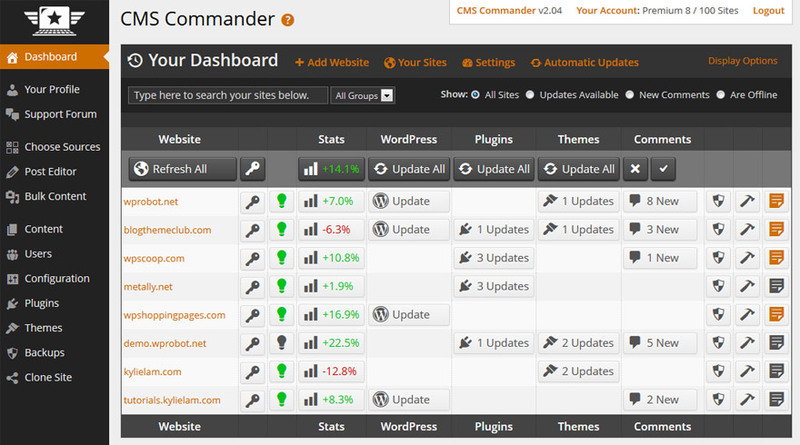 Besides CMS Commander and ManageWP I have compared several other WordPress management plugins on WPscoop. I recommend you start your search for CMS Commander alternatives or ManageWP alternatives in the main comparison article. There you can filter all different products and search for the features you need. Which one is the better blog management service: CMS Commander or ManageWP? Please share your opinion or experience in the comments! Another feature you may want to add to your list is payment options. CMS Commander accepts PayPal and ManageWP does not. Thanks for all the reviews you did on the wordpress management systems. i am late in this conversation, but want to add my experience. I have been using ManageWP for a few years for about 20 sites. It was easy to use and fairly reliable. So, here is the “but”… but, they recently redesigned their interface to “Orion” and it has been a horrible experience. The user interface is sloppy and complicated. This prompted me to search for a new system. CMScommander and iControlWP are two of my finalist. Both have easy to use interfaces. I like CMScommanders backup system better (I can save to Google Drive (iControlWP uses their own system). In any case, I give CMScommander the thumbs up over ManageWP. The new ManageWP dashboard is mess… Hope this is helpful. One thing that I would ask be clarified between the two. ManageWP has tiered pricing based on features you want to use – whereas – CMS Commander is all inclusive. If that’s the case that would make CMS Commander a better value, to my mind. Is this the case? Yes, it is true that ManageWP has tiered pricing and CMS Commander does not. Because of that for most people ManageWP would be more expensive. You can go to the main article of this WP manager comparison and enter the features you need to get an exact price comparison between CMS Commander and ManageWP. James Mowery, CEO of ManageWP here. I just wanted to make you aware that the comparison table is not accurate as it stands. ManageWP includes Self Hosted options, primarily for larger enterprises, universities, government, and other high-end clients and other institutions that have specific needs for data retention. You can very easily bulk edit any WordPress posts and pages within ManageWP’s dashboard. You can bulk create and manage multiple WordPress user accounts within the dashboard, which we consider essential for security reasons. Furthermore, you also have the ability to easily access all your dashboard and rapidly make changes to settings. Can you please update the article to reflect this? Hi James and thanks for your comment. The fact that you offer a self-hosted option for enterprise clients is noted in our ManageWP review under unique features. It can not be included in the comparison since the self-hosted version is not publicly available and does not have a price tag attached. I have updated the comparison and included the bulk create WP users feature for ManageWP, that was indeed missed. I can not find any details regarding bulk editing posts or pages though, neither in your software nor in its documentation. Can you point me in the right direction? Sorry for not following up on this sooner, James suffered an injury a while back, preventing him from responding. Hi Nemanja and thanks for the update. I have added the bulk edit feature to ManageWP in the comparison and updated the review with an explanation of your changed pricing. I am currently using the Standard 5 Domain ManageWP. I also run several Drupal sites that I thought of considering CMS Commander but I am in process of switching over. My main concern right now and should be a red flag is that your SSL Certificate is expired and you do not use SSL for the dashboard. That means that my login/pass credentials are all in the open, more concerned fact would be if the other 5 domain credentials are out in the open. RapidSSL sells certs. for less than 10 dollars. Hi Mark, I think James Mowery is not with ManageWP anymore so your comment here might get missed. Better try contacting them directly with your concerns.